A Mother’s love is sure to find, it’s selfless and makes us feel so special. So you guys should reciprocate this unique love on Mother’s day, share a Baileys with your mum on this special day. 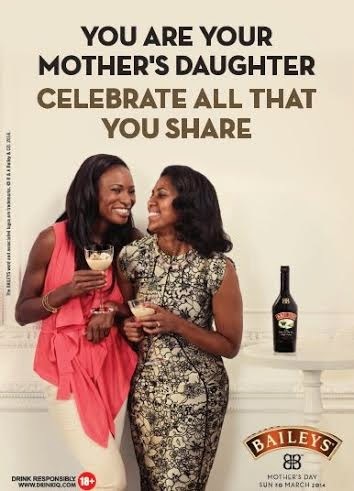 · Baileys is set to make this year’s Mother’s Day celebration the best you & your mum have ever experienced. · You can win lots of prizes, including;Vlisco Hollandais, Pashmina, Fascinator hats, brooches, matching shoes& bag, feminine wallets, a ticket to attend the Women’s Award night and other lovely gifts - which you can win instantly through a lucky dip when you purchase Baileys in any of the participating stores pan-Nigeria. · This Sunday, 30th March,Baileys Boutique will be in Ikeja shopping mall Lagos, Grand Tower Abuja and Polo Park Enugusimultaneously to glam up all the lovely ladies and their mums. Come and experience a professional makeup session with theBM Pro team while you are pampered the Baileys way. Check outwww.facebook.com/BaileysNigeria and join the conversation on Twitter with the #tag #ShareABaileysWithMumfor more details. · Baileys is for persons above 18 years. · Remember to drink responsibly.